Born 23 March 1906 at 201 Manchester Road East in Little Hulton, Bolton, Lancashire [registered in Bolton, June 1906]. According to the 1911 census, James is the eldest of two children to Fred and Jane, a third child had tragically died before 1911. His sister, Hilda, is just one month old. His father is a coal mine hewer. They live at 201 Manchester Road East in Little Hulton. 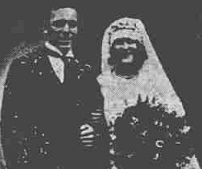 Married: to Elizabeth Davies, on 19 May 1930 at Walkden Primitive Methodist Church, Walkden [registered in Bolton, June 1930]. The Rev. G. Emmott, superintendent minister, officiated. Mr. J. Cousin, the organist. "The bride, who was given away by her father, wore an ankle-length dress of white suede crepe with tight-fitting bodice. The dress was trimmed with orange blossom and lovers' knots in pearls. She wore a wreath and veil, with orange blossom, and carried a bouquet of tea roses and lillies of the valley. Her bridesmaids were Miss Hilda Hampson, sister of the bridegroom, and Miss Ellen Davies, sister of the bride. Each wore a link of pearls, the gift of the bridegroom, and carried bouquets of pink carnations. The best man was Mr. Fred Hampson, brother, and another brother, Mr. Harold Hampson, was groomsman. A reception was held in the Primitive Methodist School. A prominent feature was a large wedding cake representing half of a football pitch with 11 figures in tangerine and black." - Monday, 19 May 1930, The Lancashire Daily Post. Height/Weight 5' 7", 11st. 5lbs . Club(s) Began his junior career playing with Walkden Park FC, and then with Little Hulton St. John's FC, from where he had a trial with Manchester United FC and Blackburn Rovers FC. He did join Nelson FC in early 1925 and develeoped his skills with the Seedhill reserves before breaking into the first-team. After scoring 42 goals in 64 Division Three (North) appearances, Blackpool FC beat other league clubs and signed Hampson on 11 October 1927 in a Nelson cinema for a �1250 transfer fee. Throughout his time, he was constantly sought by other clubs, The Arsenal FC in September 1928. Derby County FC in October 1929. Arsenal FC again during the same season, this time with a �10,000 offer. Blackpool were forced to strenuously deny in October 1931 that Hampson was to be transferred. Manchester United FC offered �10,000 for both Hampson and Bob Finan on 12 October 1937. He had made 361 league appearances, and amassed a tremendous tally of 248 goals, before his untimely death. Individual honours Football League (four appearances). Distinctions Registered three consecutive hat-tricks for Nelson FC in his first season. His 45 goals for Blackpool FC in 1929-30 is a club record. Brother of Harold Hampson (Everton FC, Southport FC & Sheffield United FC). Also a fine cricketer, playing with Nelson CC and Blackpool CC. Player number One of five who became the 553rd players (555) to appear for England. First match No. 173, 20 October 1930, England 5 Ireland 1, a British Championship match at Bramall Lane, Little Sheffield, Sheffield, aged 24 years 211 days. Last match No. 184, 7 December 1932, England 4 Austria 3, a friendly match at Stamford Bridge, Fulham Road, Fulham, London, aged 26 years 259 days. "Jimmy Hampson, Blackpool's famous centre-foward, was fined 10s. at Blackpool, to-day, for causing an obstruction in the street by leaving his motor car unattended. Superintendant Hannah said it was his first offence. The Chairman: Jimmy Hampson will have to be the same as anybody else (Laughter.)" - Friday, 20 June 1930, The Lancashire Daily Post. "Disaster overtook a party of six men returning from a day's fishing trip off Fleetwood last night. Their yacht collided with a trawler and sank, and two of the men were drowned. They were Jimmmy Hampson, the Blackpool and international footballer, and Mr H. V. Newsome, brother of a former Mayor of Blackpool. Three of the men were rescued by life-lines thrown from the trawler, and the fourth was saved as he clung to the top of the yacht's mast. A young deck hand in the trawler, who jumped into the sea when he heard the men's cries, had to be rescued himself after struggling for 20 minutes in the water. He was wearing a new jersey, the sleeves of which slid down over his hands, making it almost impossible for him to swim. "The six men were returning from a day's fishing in their 41-feet yacht Defender when their craft collided with the Fleetwood trawler Cameo. The two men drowned were [Hampson and Newsome]. The rescued men are:�Harold Jones and his son, David, of South Promenade, Blackpool; W. H. Peake, of Lowery Terrace, South Shore, Blackpool, and Samuel Colley, skipper of the yacht, of Fleetwood. All the men were in the cockpit, sorting the day's catch, when the yacht collided with the trawler, which was outward bound for the fishing grounds in charge of Skipper J. Ainsworth, of Fleetwood. "When the trawler returned to port the skipper gave a graphic account of the mishap. 'We were steaming down Wyre Channel and had reached a point about midway between the Wyre Lighthouse and the Promenade when, from the wheelhouse window, I suddenly saw the mast of a yacht right in front of the trawler's bows. A crash seemed inevitable, but I jammed down the telegraph to the engine room for full speed astern. In this way, I avoided a head-on collision, but the yacht, after sheering off, struck the side of our ship near the bows. That yacht sank immediately, and in a flash her occupants were thrown into the sea. We could hear men shouting for help in the darkness from all directions. All hands were on deck. The work of rescue was made extremely difficult because we could not see anyone in the water. We had to man�uvre the trawler in the direction of the cries. We were able to rescue four of the men. Three of them were thrown life-lines, while the fourth was clinging to the top of the yacht's mast with only his head above water.' Other members of the crew told dramatic stories, and the hero of the tragedy was 19-year-old Tom Hargreaves, of Lancaster Road, Knott End. Hargreaves is a deck hand in the trawler, and a few seconds after the collision he saw someone's head floating past the trawler. He immediately threw off his heavy sea clothing and dived over the side. 'I was floundering in the sea for about 20 minutes, but apart David Jones I did not see any of the men from the yacht, and I had enough to do to look after myself, as my jersey was gradually drawing me under'. Eventually Hargreaves himself had to be rescued by his shipmates. "Cries of the men in the water and also of the trawler men were heard by the man on watch in Fleetwood lifeboat house, and within a few minutes a small boat left the beach manned by the coxswain of the lifeboat and other lifeboatmen. They went out to the scene, but returned without having seen anything of the yacht or the two missing men. Later to-night the ferry service between Fleetwood and Knott End was stopped to enable the steamer Wyresdale, manned by the police, to take part in the search of the channel." - 11 January 1938, The Leeds Mercury. "Mrs Hampson gave birth to a stillborn child last Tuesday, and is ill at her home in Woodfield Grove, South Shore, Blackpool. She has not been told of her husband's death. Hampson, although worried by his wife's illness, turned out for Blackpool in the Cup-tie against Birmingham on Saturday, and showed some of the form which earned him international honours and materially assisted Blackpool's weakened side to win. The news of his fate caused shock in the town, many at first refusing to believe it. Hampson was a popular player. Temperamental to a certain degree, he made many friends. He was a keen fisherman, and only last summer had a narrow escape at Fleetwood when the boat from which he was fishing nearly capsized in the wash of a trawler." - 11 January 1938, The Evening Telegraph. "Memorial Service for Jimmy Hampson. "Notices offering a reward of �5 for the finding of the body of Jimmy Hampson are displayed in Morecambe and Heysham shop window. "Accompanied by her mother and father, Mrs. Hampson, widow of Jimmy Hampson, [yesterday] visited the spot in the Wyre Channel where her husband was lost a short time ago. When the place where the yacht Defender sank after colliding with the Fleetwood trawler Cameo was reached. Mr. H. A. Howes, superintendent of the Fleetwood branch of the Royal National Mission to Deep Sea Fishermen, held a short service, and Mrs. Hampson cast a wreath into the sea." - Thursday, 24 March 1938, The Leeds Mercury. "Two photographs, of Jimmy Hampson and Mr. Harry Newsome, were unveiled at the Central Bowling and Social Club, Blackpool, last night, by the Mayor (Ald. J. R. Quayle)." - Wednesday, 6 April 1938, The Yorkshire Post.